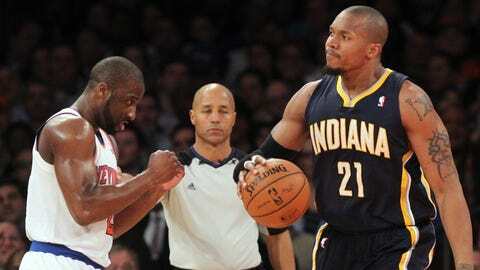 David West and the Pacers failed to extend their three-game lead over the Miami Heat, who lost earlier in the night. NEW YORK — Long after Phil Jackson acknowledged the cheering fans with a thumbs-up and then a wave, there was one more standing ovation inside Madison Square Garden. This one went to the Knicks, a far cry from the way they were treated at home earlier this season. Carmelo Anthony scored 34 points and New York opened the Jackson era by beating the Indiana Pacers 92-86 Wednesday night for its season-high seventh straight victory. With their new team president watching from a midcourt seat, the Knicks dominated the first half, then pulled away after the Eastern Conference leaders finally got untracked in the second. "With a guy like that around it creates a winning mentality, it creates an atmosphere that’s pretty golden and we’ve got to capitalize on that," Knicks forward Amare Stoudemire said. Fans stood for Jackson in the first quarter and were on their feet again in the final minute to watch the Knicks beat the team that knocked them out of the playoffs last year. "There’s energy in the city. Bringing Phil back is huge for this franchise I think," coach Mike Woodson said. "But I’ve got to give a lot of credit to those guys in the locker room too, because again, we’re battling. We’ve dug a hole and we’re trying to dig our way out of the hole." Lance Stephenson had 21 points and nine rebounds for the Pacers, who had their four-game winning streak snapped and failed to extend their three-game lead over the Miami Heat, who lost to Boston earlier Wednesday. Roy Hibbert scored 20 on 8-of-10 shooting, but All-Star Paul George missed all six first-quarter shots and finished 4 for 17 for his 17 points. "We haven’t grown our IQ as a team into improvising when teams try to throw little wrenches into our offense and that’s where we’ve got to grow offensively," George said. New York’s previous six wins had all come against non-playoff teams, but this was against a team that seemingly had returned to form after dropping a season-worst four in a row. "The teams that we play, we feel like they’re in our way. That’s our motto right now. They’re in our way and we don’t want to let nothing stop that," Anthony said. Stoudemire added 21 points and Tyson Chandler grabbed 14 rebounds for the Knicks, just 16-20 at home and four games behind Atlanta for the final East playoff spot. Jackson met with coaches and players earlier Wednesday, then watched the game from a seat above center court, receiving loud applause when he was shown on the overhead screen during a first-quarter timeout. The 11-time champion as a coach also was on the Knicks’ only two title-winning teams as a player, and there was a different energy in the building during what’s been a hugely disappointing season until recent days. Woodson said before the game he wasn’t angry that Madison Square Garden chairman James Dolan had originally talked to Jackson in December about the coaching job, adding that "the city should be buzzing" over his return. (Not all of it is; a group of fans frustrated with Dolan’s leadership of the franchise went through with a previously planned protest outside the arena before the game). Hibbert scored 14 points in the third quarter to help Indiana wipe out nearly all of a 16-point deficit, and it was just a one-point game early in the fourth when George made just his second field goal. But the Knicks answered with eight in a row, going ahead 75-66 on Stoudemire’s basket with 7:57 remaining, and Anthony spun for a dunk and knocked down a jumper for consecutive scores after Indiana trimmed it to five with under 4 minutes to go. "In the first half we tried to do it ourselves and only had two assists," Pacers coach Frank Vogel said. "In the second half we played much better. Shared the basketball better, we screened better, but we fell short." Woodson improved to 45-16 in March and April as Knicks coach, but New York faces an uphill climb to dig out of the hole a 2-11 February created. NOTES: Andrew Bynum will be out the rest of the week resting his sore right knee. The center aggravated his troublesome knee after playing Saturday against Detroit, his second appearance since signing with the Pacers. He has averaged 11.5 points and 9.5 rebounds thus far. … Indiana won both earlier meetings and was trying to sweep the series for the first time since 2007-08.